Keep your pool clean and inviting with our swimming pool cleaning service and supplies. When you own a swimming pool, one of the most enjoyable parts is taking that first plunge on a hot summer day! 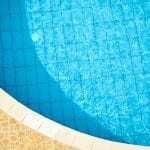 However, if your pool hasn’t been properly cleaned, that plunge is out of the question and your swimming pool will still look inviting, but will go unused. If you want to enjoy all the fun of having a pool without the hassle of swimming pool cleaning, why not let us help? Here at Cayman Pool & Spa, we offer swimming pool cleaning services for pool owners around Harrisburg, North Carolina. Calling us at Cayman Pool & Spa for swimming pool cleaning means that not only will your pool be impeccably clean, but the water will be clean as well. Proper chemical balances in your pool water are essential to pool safety, maintenance, and the health of those who swim in your pool. Small changes in environment or even the number of swimmers can affect the chemical balance of your pool. With swimming pool cleaning from us at Cayman Pool & Spa, you can have clean water, properly balanced water, and a clean pool when you want it! At Cayman Pool & Spa, you can count on us for your swimming pool cleaning needs. Whether you want us to perform your swimming pool cleaning service so that you don’t have to, or if you prefer to do it yourself and want top-of-the-line supplies to work with, we can help you! Come and see us today at Cayman Pool & Spa for more information about our wide variety of supplies, services, and chemicals you can use for your next swimming pool cleaning. At Cayman Pool & Spa, we offer swimming pool cleaning services in Mooresville, Concord, Cornelius, Davidson, Harrisburg, Huntersville, Kannapolis, Statesville, Troutman, and the Lake Norman area of North Carolina.